SFA's A Cappella Choir (pictured), Men's Choir and Women's Choir, with Dr. Michael Murphy and Dr. Tod Fish conducting, will present the annual "Christmas Celebration" concert at 7:30 p.m. Friday, Dec. 7, in Turner Auditorium on the SFA campus. NACOGDOCHES, Texas - The choirs at Stephen F. Austin State University, along with many guest musicians, will present SFA's traditional holiday concert at 7:30 p.m. Friday, Dec. 7, in W.M. Turner Auditorium on the university campus. The highly anticipated "Christmas Celebration" concert will feature "Lux Aeterna" (Light Eternal) by acclaimed contemporary composer Morten Lauridsen, along with other seasonal favorites, according to Dr. Michael Murphy, director of choral activities for the SFA School of Music. SFA's A Cappella Choir, Men's Choir and Women's Choir, with Murphy and Dr. Tod Fish conducting, will be accompanied by organist Dr. Christina Harmon. The program also features Leroy Anderson's "Sleigh Ride" and a Christmas carol audience sing-a-long. 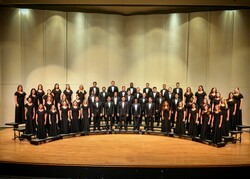 The concert is a joint presentation of the SFA College of Fine Arts and School of Music. Turner Auditorium is located in the Griffith Fine Arts Building, 2222 Alumni Drive.